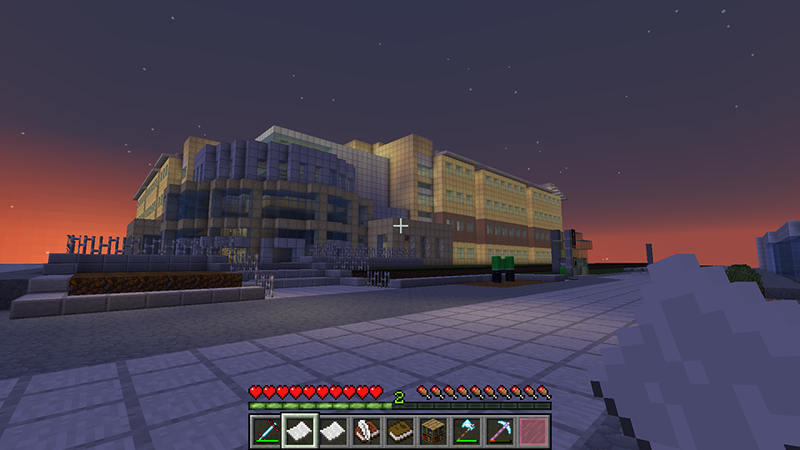 Living large: On campus housing at UT Dallas as represented at sunset in Polycraft World. UT Dallas is a public state school in the University of Texas System and an emerging research powerhouse. The beautiful UT Dallas campus, which has been designed by world renowned landscape architect Peter Walker, provides a starting canvas and inspiration for the starting terrain of Polycraft World. UT Dallas is in the center of the map. In the northwest, Companies will be able to claim land. These features will be released in early 2016. In the northeast, Private Property lands are passed out to anyone who signs up for Polycraft World. Each player's personal domain consists of 7 by 7 chunks or 112 x 112 blocks. There is a one chunk (16 x 16 block) buffer around all personal private properties. In the southeast, Base Camps are distributed and increasingly larger intervals. These are private properties to which you can teleport from other private property to aid in bring resources from afar back to your private property. Silicon Ore and Cinnabar can only be found at large distances from UT Dallas, (i.e. any chunks that had not yet been explored when 1.3.5 was released). In the southwest, there will not be any private properties. This land can be explored via traditional means (foot, horse, boats, chained nether portals) or newer means (running shoes, pogo sticks, scuba gear, jet packs). No one will be able to teleport to or from these areas. The Trellis at UT Dallas is the World Spawn and located at coordinates (0, 80, 0). UT Dallas takes up the entire level 5 map surround this point. The XZ coordinate (-1023, -1023) forms the northwest corner. The XZ coordinate (1039, 1039) forms the southeast corner. Email support@polycraftworld.com to request to be added to the editors group from UT Dallas. If you are added to this group and do anything against the spirit of Polycraft World, you will be banned from all servers. This page was last modified on 14 November 2015, at 00:01.